Acidex Oral Suspension relieves the symptoms of heartburn and acid indigestion. Acidex can be used in the mangement of acid indigestion from gastric reflux and hiatus hernia. Fast effective relief from heartburn and acid indigestion. Adults and children over 12 years, 10-20 ml (two to four 5 ml spoonful’s) after meals and at bedtime. 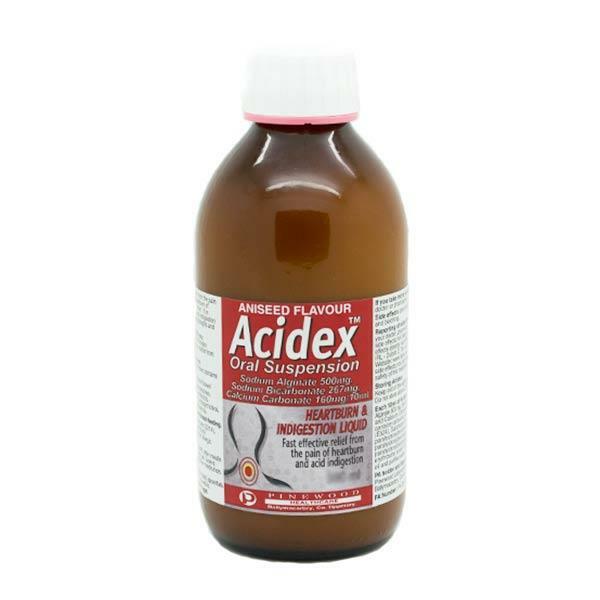 Each 10 ml of Acidex contains sodium alginate 500 mg, sodium bicaronate 267 mg and calcium carbonate 160 mg.
Acidex Liquid Aniseed Oral Suspension is a reflux suppressant and helps to relieve symptoms such as heartburn and acid indigestion. The medicine creates a layer over the content of the stomach preventing excess acid from escaping. Acidex Liquid can be used by adults and children 6 years and over. This medicine should have no effect on your ability to drive or operate machinery.